Want to be notified of new releases in FinweLtd/orion360-sdk-test-content? Finwe offers a set of test images and videos for testing purposes free of charge under a Creative Commons license (see end of page for details). Finwe takes no responsibility of any errors in the images. The images and videos are specifically designed for testing various features of 360° image/video projections and playback. Some of the test images are completely artificial and may no represent any real world use cases, but provide important insights to a trained eye that knows what to look for. Notice that when a test image is uploaded to a third party service, such as 360° photo or video hosting service, it is usually processed in a way that severely affects image/video quality. The original cube face image was created with a vector graphics software Inkscape, and exported as a 4096×4096 tiff file. It was then labeled for each cube face in Photoshop, and exported as six PNG files. These files were stitched with PTGui and exported as multiple resolution JPGs using equirectangular projection. 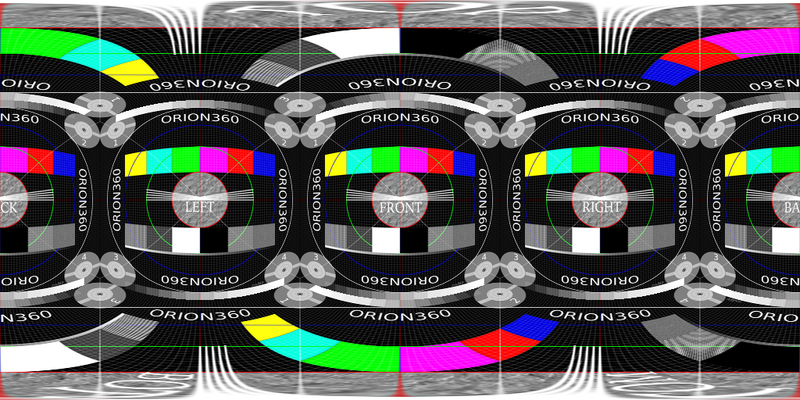 Finally, the videos were created with ffmpeg from the same resolution equirectangular source image.